Smoked chili peppers add new dimensions to your cooking and recipes, and it’s a great way to preserve a bountiful harvest. Here is how to smoke them at home. If you’ve ever had a chipotle pepper, you’ve had a smoked pepper. There are many ways to preserve your chili pepper harvest, including drying peppers, freezing peppers, pickling peppers and more, though most people don’t consider smoking chili peppers as a way to keep your harvest. It’s time to consider this method more fully. Smoking chili peppers allows you to incorporate new flavor elements into your dishes. Consider substituting fresh or roasted peppers for lightly smoked peppers for a nuanced smoky changeup. Or, smoke and dry them completely then grind them into powders for your own custom smoked chili powder blend. This is what I love to do. 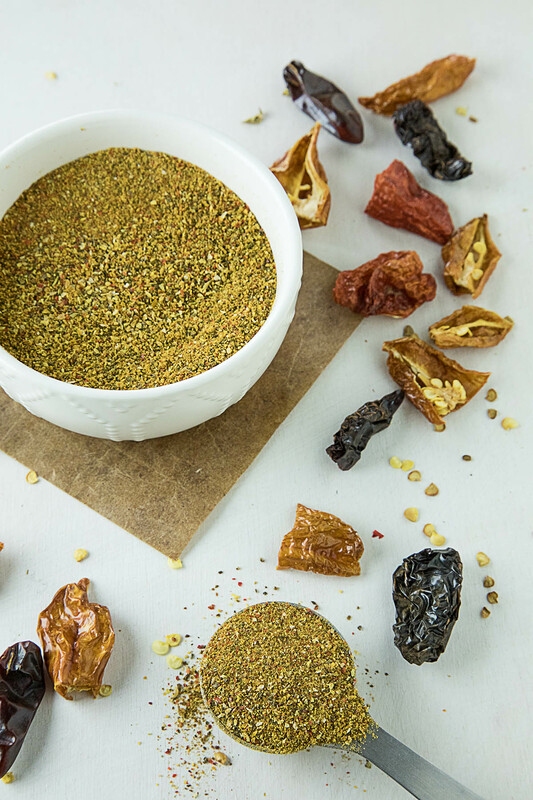 Combine smoked chili powder with other ingredients for homemade rubs and seasonings that you can sprinkle over dishes or create roasted or grilled meats that no one has ever tried before. You can swell with pride as you withhold your new secret ingredient. Or feel free to share! Smoked chili peppers should be enjoyed by all! Let’s talk about the method. First, wash and dry your chili peppers. Make sure they are free from dirt, and use only the freshest of peppers. If they show any signs of rot, toss them out. Next, slice the peppers in half and core them out, if desired. You don’t need to, though. I keep them intact as most of the heat is within the pepper innards. Again, if you see any rot, toss them out. Also, if the peppers are thicker walled, you can slice them into quarters or rings, therefore increasing the surface area for the smoke to penetrate. Next, prepare your smoker and heat it to 200 degrees F. Set the peppers on a tray or over aluminum foil so they don’t fall through your grates and set them into the smoker. You’ll need to follow your own smoker instructions for maintaining your overall temperatures. You can also use your grill with a smoker box, as long as you are able to maintain a constant temperature. Next, get your smoke going. There are many different wood options available to you. I prefer maple wood, though mesquite is a good choice, as is hickory. Here you should really experiment with wood of your choice, as each will impart a different smoky flavor. Use enough wood to smoke the peppers for 2-3 hours. 3 is best, as it takes a while for the wood smoke to truly permeate the peppers, but check on them at the 2 hour mark to make sure everything is OK. At this point, the peppers will be smoked but not completely dried. Thinner peppers will be dryer than others. If smoking thinner walled peppers like habanero peppers, smoke them for less time if you plan on using them in a non-dried form. You can use them in different recipes at this point if you’d like. Freeze them for future meals or preserve them in oil, or just hold them in the fridge where they will last a couple days. You can smoke longer if you’d like, as the peppers will not be completely dried after 3 hours. It will take many more hours to completely dry the peppers in the smoker, but I prefer a different method to finish the process. 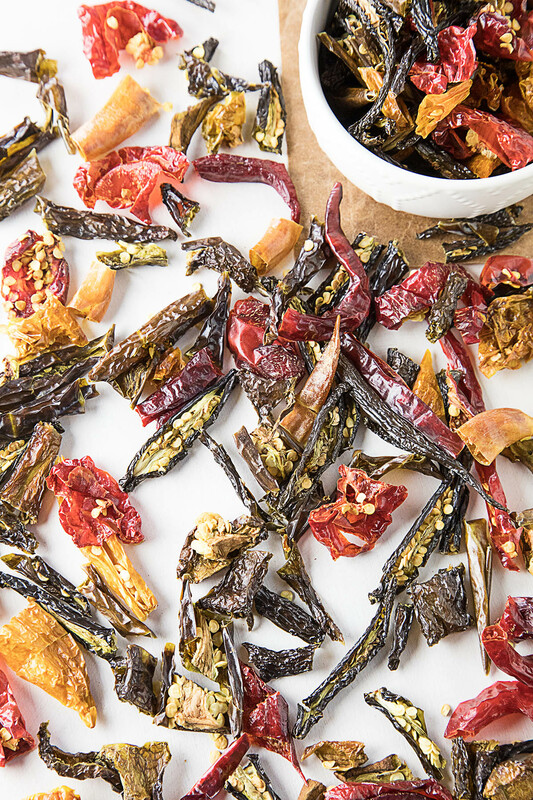 Finally, dry your smoked peppers in a dehydrator. A dehydrator is the most efficient way to completely dry chili peppers. 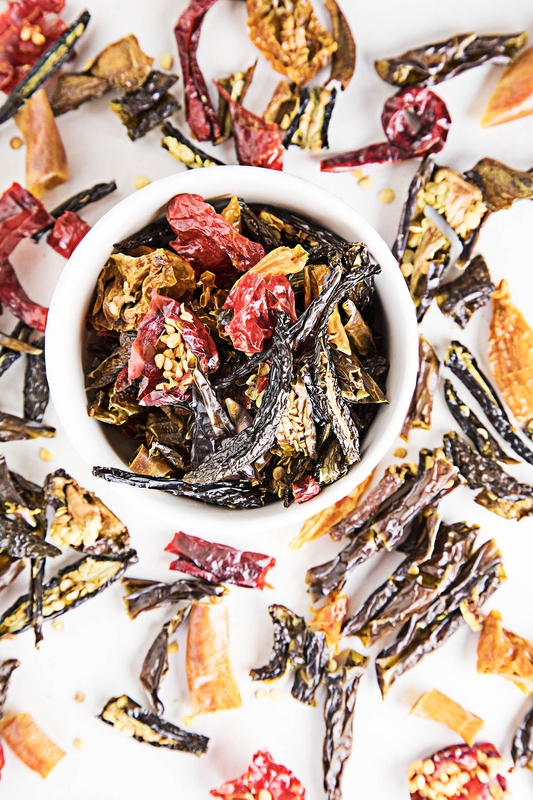 Transfer the smoked peppers to your dehydrator trays and dehydrate them at 125 degrees F for about 8-10 hours, or until they are completely dried through. At this point, you can store the pods in sealable containers and use them as needed. What to do with Smoked Dried Chili Peppers? Smoked and dried chili pods can be rehydrated in hot water and used in any number of dishes. See How to Rehydrate Chili Peppers. Alternatively, crush them and sprinkle over foods, or grind them into powders for making new blends and seasonings, or just sprinkle them as they are for a nice touch of smoked chilies. Be sure to use gloves if handling hotter peppers, as they may irritate your skin. This is particularly true of superhot peppers. 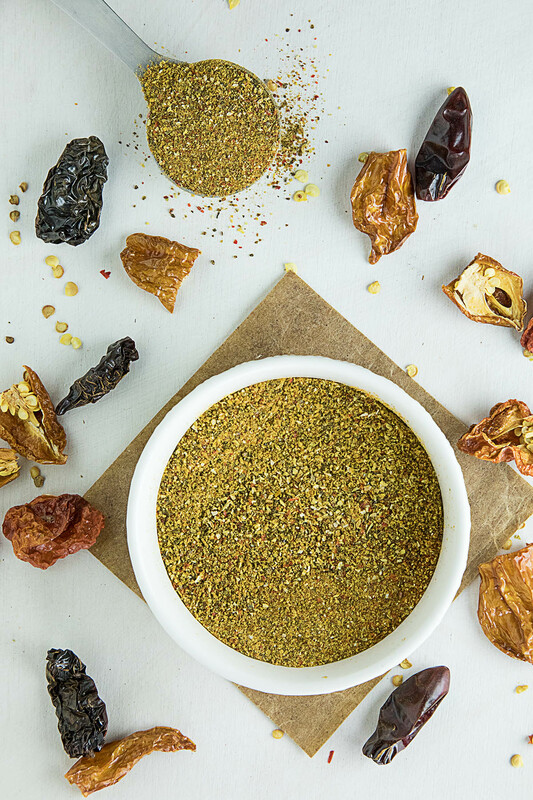 Check out our information for How to Dehydrate Chili Peppers and Grind them Into Chili Powders. 2 pounds of chopped pepper pods yields about 3-4 cups of dried peppers, and when ground, yields about 1 cup of powder. I made some smoked chili powder with my yield. Use in as you would any recipe that calls for chili powder. It adds a nice smoky element to the dish. Chipotles are nothing more than dried smoked jalapeno peppers. They are typically made from red jalapenos, so follow the instructions above with your selection of jalapeno peppers. Use a milder wood to impart a lighter smoke flavor. Once smoked and dried, you are free to store them and rehydrate them as needed, or grind them up, per above, into a perfect homemade chipotle powder. If you enjoy this recipe, I hope you’ll please share it on social media. Don’t forget to tag us at #ChiliPepperMadness. I’ll be sure to share! Thanks! — Mike H.
Hi, I’ve stripped my plants for overwintering and have a lot of green habeneros, bhut jolokias, and Carolina dealers. Can I smoke them green, like poblano/anchos, and finish off in the dehydrator? Not generally advised to dehydrate green chillies. Richard, yes, you can still treat them this way, even if they’re green. Let me know how they turn out for you. I am anxious to try this. I have a bunch of ghost, habanero, Carolina reapers, jalapeno (red & green) as well as some Thai chili peppers. They have all done well dehydrated and made into Caribbean style pepper sauce. I’ll share that recipe on the right recipe post ASAP. It’s fantastic. Unfortunately I’m in the no-smoker having crowd. That’s an investment to come and they are getting cheaper and electric ones are really good now. I have a gas grill so will be trying that. I’ve read a lot about this over the past few days. I have some pecan chips and am maybe going to see about picking up some apple chips or something else. I don’t have a smoker box but found DIY options using non-lined steel cans or a foil pouch. I’ll probably go with the pouch method because of ease. If it goes well, I’ll invest in a cast iron box. Let me know how it goes, Jason. At a minimum, it’s pretty easy to simply wrap some chips in aluminum foil and poke some holes in it, then use that on the grill to get some smoke. Is this just for chili peppers? Looking at your pic you have lots of different peppers. Which type is best for this? To me chili pepper is long skinny and red. I have several varieties of them. Anna, yes, you can use this technique for any type of chili pepper. I have smoked many different kinds and dehydrated them to make interesting seasonings. Let me know how it turns out for you. When smoking the Chile, does the smoke (put out from the smoker through the vent and when you open the door) release a burning sensensation that one should take precautions of? Hi, Sarah. I didn’t notice any issue, but that is a great question. I definitely get fumes in the kitchen, but since I smoke them outdoors, those fumes dissipate pretty quickly. If you’re smoking superhots, though, you may need to be wary, but still, with the open air, I’m sure you’ll be fine. Let me know how it goes! Whatever you do, do not use your oven or you will be choking for a while! REPLY: Dora, yes, I wouldn’t try this indoors. — Mike from Chili Pepper Madness. I do not have a Smoker, is there an alternative way of doing this? REPLY: Thando, you can use a grill with a small smoker box. — Mike from Chili Pepper Madness.